I'm beginning to construct a cabinet that has 10 39" wide by 2" high drawers. The drawers will only hold large sheets of paper. I am aware of specialty hardware for wide drawers but will those be necessary for drawers that are only 2" high? Can I use standard side ball bearing side mounts? Side mount slides should work fine. The drawers may rack a bit if there are 2 pulls installed and the user only uses 1. 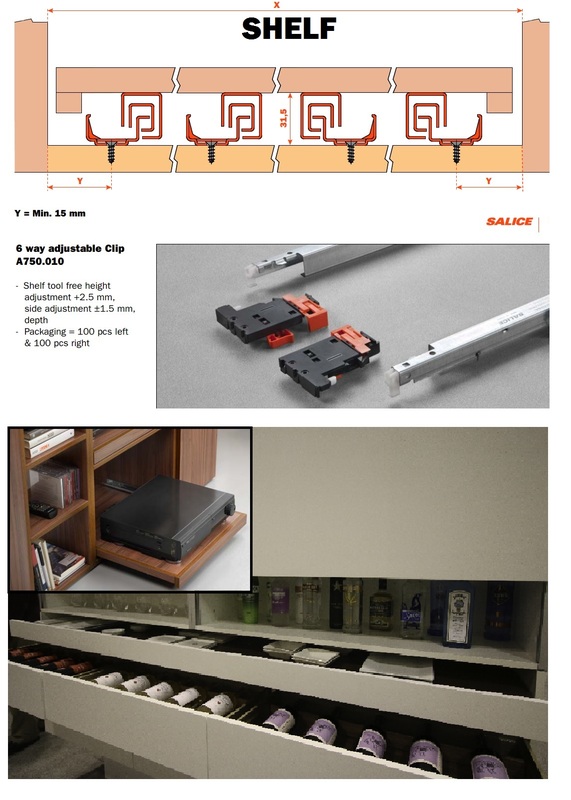 A possible solution may be a new slide from Salice called “Shelf”. Shelf is a concealed full extension undermount drawer slide designed for pull-outs and other drawers that may have exceptional width. By simply adding additional slides under the drawer, wider drawers can be accommodated with exceptional stability. For your application described here the only limitation may be the size (height) of the opening available. Here are some details and a photo from a display where the Shelf drawer slide was used in drawers that measured nearly 6’ wide. For your application (39”), 3 slides would be plenty. Shelf is available in both soft close and “Push” to open for handle free designs. I forgot to mention that the drawers are 26" deep. Not sure if that makes a difference. That rules out my suggestion. 24" (600mm) is the longest length for the Shelf slide.